"They're not just getting rich... They're getting even." 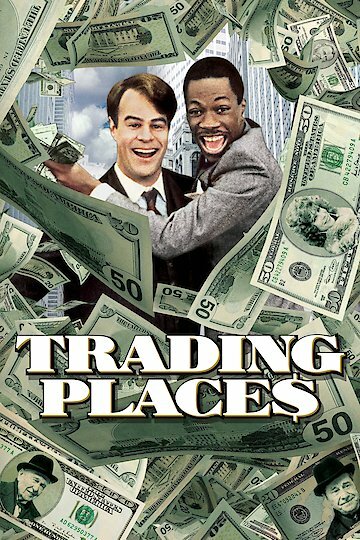 Dan Aykroyd and Eddie Murphy star in Trading Places. This comedic movie made its debut in 1983. In the beginning of the movie, you see Eddie Murphy, as a homeless bum/con artist who is living on the streets. Eddie is noticed by two wealthy brothers and so the plot thickens. Murphy is propositioned by the brothers to come work for their multimillion dollar corporation. Since he is homeless, without money and food, he without hesitation agrees. The brothers promise the World and more to Murphy's character. But, what Eddie will eventually find out will change the whole story. You see, the brothers actually made a bet for a total sum of one dollar to see if given the opportunity, would a black man do as good in the surroundings as a white man would? The brothers find the perfect gullible uppity white man for this experiment(Dan Aykroyd). They set the man up so he would loose his mansion, his butler, his job, his money, his limo and his woman. They have Murphy basically move into this man's house and take over his life. The plan works out for the millionaires until Murphy overhears their deceitful plan. Murphy seeks out Aykroyd to report his suspicions. The two start working together to conjure up a plan of revenge of their own. The duo work together to put the millionaire brothers in bankruptcy. Denholm Elliott, Dan Aykroyd, Maurice Woods, Richard D. Fisher Jr.
Trading Places is currently available to watch and stream, download, buy on demand at IFC, Amazon, Vudu, Google Play, iTunes, YouTube VOD online.